Filipinos all over the world are celebrating National Heroes’ Day in a different way today. 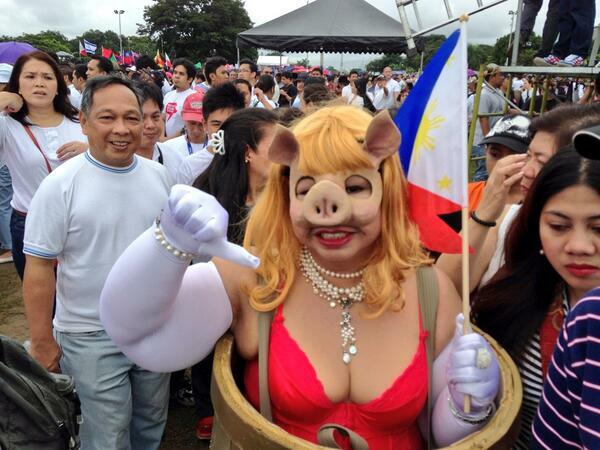 People are marching for a cause and this is dubbed as MillionPeopleMarch. This is the Filipinos’ way of fighting against corruption. 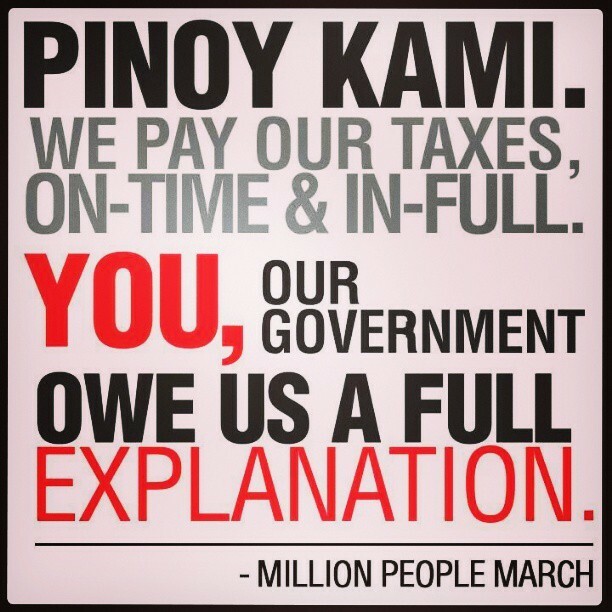 The Pork Barrel scam has sparked outrage from the masses, from the people who pay their taxes diligently (and painfully). Bilang isang mamamayan ng bansang Pilipinas, ako ay isa ring taxpayer. At dahil ako ay single, malaki laki na rin kung maituturing ang bahagi ng sahod ko ang napupunta sa gobyerno. Alam ko naman na tungkulin ko ito bilang isang Pilipino. Nakinabang din naman ako sa pera ng gobyerno dahil isa akong iskolar ng bayan magmula ng ako’y nag aral sa prestihiyosong mga eskwelahan tulad ng Philippine Science High School at MSU-IIT. Naisakatuparan lng din ang pagkuha ko ng Master’s degree ng IT sa Ateneo de Davao dahil sa CHED iskolarship. Kaya masaya rin naman ako na alam kong may isang katulad ko ang makikinabang sa perang binibigay ko sa gobyerno. Ngunit kapag ako ay may mga naririnig na balita tungkol sa korapsyon sa gobyerno, nasasaktan at nagagalit ako. Lalo na’t para sa akin ay malaking halaga ng sahod ko buwan buwan ang napupunta sa kanila. Nagtitipid ako para mapagkasya ang perang natititra sa sahod ko tapos wawaldasin lang ng ibang mga pulitiko?! Ano ba naman yan… E di sana ako na lang ang nagwaldas ng perang pinaghirapan ko, d ba? O kaya binigay ko nlng sa simbahan o kaya sa mga charity institution? At least, sure akong nakakatulong ako at hindi sa bulsa ng kung sinu-sinong mga kurakot napupunta ang perang pinaghihirapan ko. Hay naku… okay, hindi naman ako tutol talaga sa pagbabayad ng buwis. Gamitin lang sana sa mabuti at para sa mas nakakarami ang pera ng sambayanan. Magkaroon ng tamang proseso hindi lamang sa pagsingil ng buwis kundi pati na rin sa paggamit nito. I am so proud of my kababayans because we are growing as a nation. We want transparency from our government. Everyone is taking part in the nation’s growth. With this awareness, I believe that we really are on our way to “daang matuwid”. Having taken PNoy’s word of having the masses as his boss and taking everyone to the right/straight (daang matuwid) path seriously, Filipinos from all walks of life are participating in making this come true. Our nation is on its way to progress! Magkaisa! Time Tracking: Where did my life go? I’ve been thinking about how I’ve been spending my time so I tracked my daily activities for the past week. Everybody gets 24 hours a day but it’s how we use those hours that give meaning to our lives. By tracking my time, I realized that I needed to plan how I should spend my Saturdays to avoid “just going with the flow” and waste a lot of personal time. 2. Make use of commute time – Reading books is hard when commuting because it hurts my eyes. Good thing I have A LOT of good audio books to listen to while commuting. This is really one good way of using commute time. 1. 8:00 am – wake up. Upon waking up, I say a short prayer of thanks and then turns on the Wifi on my phone to check on latest updates (FB notifications, emails, etc.) or respond to text messages. I’d stretch on my bed and get a few more minutes of sleep before I finally decide to get up and start preparing for work. 2. 8:30 – 8:45am (.75 hr)- get up. Yes, it usually took me 30 to 45 minutes before I finally get up from bed. It’s actually because I had late night calls at work and had to stay in the office until 9pm so I was trying to get more sleep. 3. 8:45 – 9:45am (1 hr)- get ready for work. Taking a bath, deciding what to wear, preparing bfast/lunch/snacks. 4. 9:45 – 10:30 or 10:45am (1 hr) – commute to work. While commuting I usually visualize what I’ll be doing at the office once I get there. This mind exercise is really effective for me. 5. 10:45 – 8:45 (10 hrs) – Work (Due to confidentiality, I won’t be able to put into detail the work that I do for the company I work for). 9:00 – 10pm (1 hr) – commute back home. 10:00 – 12mn (2 hrs) – eat, FB/Instagram/watch TV/Mindless surfing and watching to relax my mind and unwind. 12mn – 8am (8 hrs) – sleep. 12:nn – 12:00mn (12 hrs) – FREE time: watch TV/movie, surfing the net, shopping, entertainment activities. How about you? How do you live your life? How do you use your time? Author MylenePosted on August 13, 2013 August 18, 2013 Categories Current Affairs, ReflectionsTags excel charts, how to spend time, life planning, planning, productivity, time management, time tracking, use time wiselyLeave a comment on Time Tracking: Where did my life go? What am I gonna do today on a holiday staycation? Remove Snap.do malware from my computer. I’m really annoyed by its presence. Download and listen to audio books. Help Laiza plan out her strategy for Data Structures class. Optimize my computer – make it run faster. Remove unnecessary startup programs. Go to the gym and join Zumba class. Meetup with Angem, my friend from Gensan. Join online call with business. Copy audio books to phone and tidy up computer and phone storage. PBSP (Philippine Business for Social Progress) has a vision of leading the business’ sectors efforts to reduce poverty in the Philippines. It has assisted a number of community-based organizations in starting and stabilizing their livelihood by providing credit as well as trainings, business advisory, and market development support. I once had an opportunity to work with the organizations and see their products. I was really pleased to see that their products are of high quality – something that we Filipinos could really be proud of. 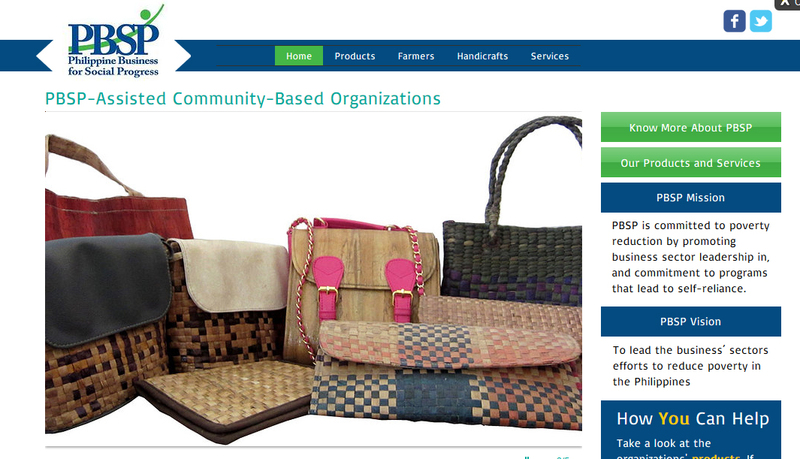 To learn more about the products and services of these PBSP-Assisted Community-Based Organizations, you can visit the site.You can help these organizations if you patronize their products/services or recommend them to your family and friends. Thanks! Do I still enjoy what I’m doing on a daily basis? [Work] Yes and no. Yes I enjoy coding in Java, unit testing, and documenting my work. What I don’t enjoy is working overtime and working late nights. They say that in the IT world, these things are inevitable especially when you’re working with people on the other side of the world. [Church Ministry] Yes. I still love serving through my 3 different ministries: Warmth (Usher), Kids (Teacher), and Media (layouting the bulletin). However I just need to make sure that I don’t overdo or over-serve or burden myself unnecessarily so that I won’t take out the joy in serving. [Finance] I want to start my own business and make it stable by the time I’m 35. I want to see my 3 little investments grow and benefit a lot of people. [Life] I want to be with my family and friends. I want to spend the remaining days of my life with the people who matter most to me. Is it worth the sacrifice of working and living away from my family? Yes. When I look at my family now, my brothers having their own fulfilling jobs, my niece growing up healthy, pretty, and smart, my parents living and enjoying life, I smile to myself. It’s worth it. However, right now I should start doing things for myself too. I have to be more giving to myself because I could never truly give to others if I won’t give to myself. How do my daily activities help me achieve my long term goals? Before I took the retreat, I honestly couldn’t find meaning in my daily activities. I couldn’t see how the things that I do everyday contribute to the fulfillment of my life dreams. But now, after the retreat, I realized that I was just tired and I needed a break. My daily activities do contribute to my life-long dreams. Actually, I am starting to live my dream. 🙂 I learn a lot in the office. I learn about managing and motivating people from my manager. I learn about customer service. I learn about getting along with others. I learn about pushing myself to my limits. I learn about finding solutions. In church, I also learn about service. I learn to be generous and trusting God. I learn about selfless giving. I learn about faith. I also learn to love others and myself the way Jesus wants me to. At home I learn how to cook and take care of myself. I learn how to be patient and adjust to the different personalities of people I live with. How can I improve my processes? What are the things that I should continue doing? What is blocking me from doing what I really want to do with my life? Have I been loving myself or did I try to please people in the expense of my own happiness? It’s the Big Day at The Feast, concluding the 3-part Full Tank series (The Joy of Grace-Filled Relationships). As I was listening to Bro Vic talk about not having greed and envy in our hearts, I remembered an event that happened 12 years ago. I felt so bad because Mama had taken time and effort to create a collage of my younger sister’s medal and graduation pictures. 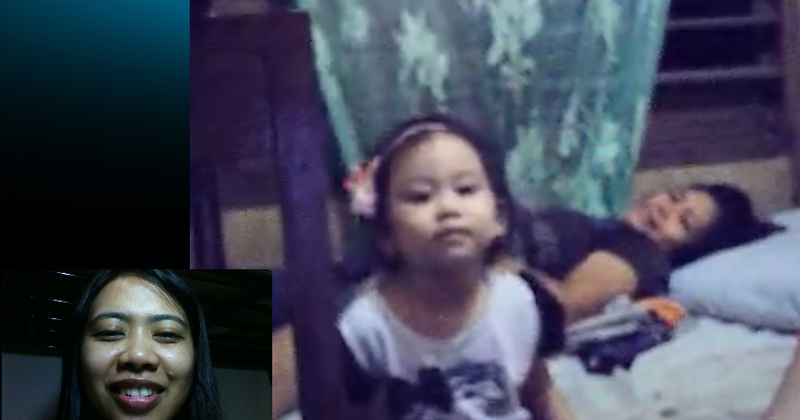 She was 4 years old, a pre-schooler at a Day Care Center at that time and I was already in 2nd year college, taking up IT. Somehow, a virus took over my mind and heart when I saw my mother putting all her effort on creating the collage. She never did that before. I couldn’t brush off the voice inside my head that’s saying it’s unfair. That she should have made something like that for me too. Where did all my hard earned medals go? They didn’t even keep it. They’re nowhere to be found. My ego was sorely bruised. I felt so jealous. I couldn’t bear the thought that she loves her more than she loves me. I couldn’t accept that she seems to be so happy that she was able to go up the stage like it was the first time (and my gosh, for a pre-schooler?)! 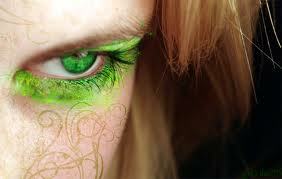 Anger enveloped my heart and that green-eyed monster kept whispering evil things to me. And I listened to all its ugly lies. Somehow at that time, I had an empty love tank. And the voice inside me was screaming, ‘how about me? Why don’t you love me? !’ Don’t get me wrong, I love my sister a lot. But the selfish 18 year old me felt so much injustice at my mother’s gesture. I wanted to let her know that what she did was wrong. I wanted to hurt her because she has hurt me. I did the unthinkable. I took the collage from the wall where my mother has hung it and destroyed it. Can you imagine an 18 year old doing such an immature act? All I could think of during that time is that I deserve more than what she’s giving to her. I deserve the attention. I deserve the praise. All I was thinking about is myself. I was totally and ridiculously selfish and grossly immature. When Mama found out about what I did, she got furious and beat me. It was the worst fight we ever had. I have hurt her so much that it was the first time that I saw her cry. I made my mother cry! 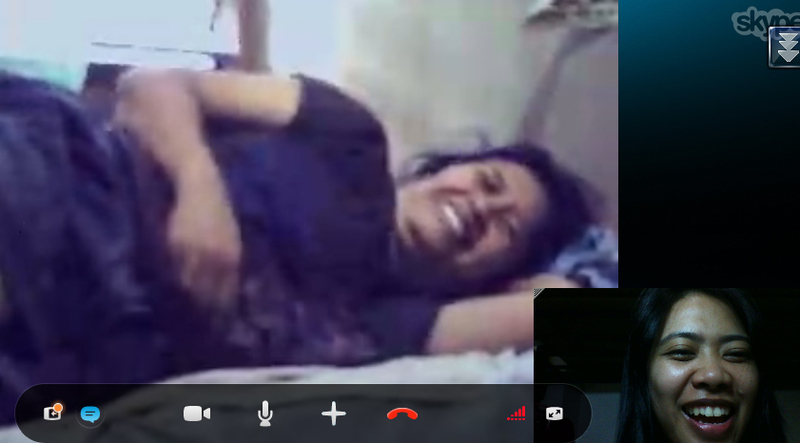 She can’t believe that I could do such a terrible and unexpected thing. I felt so guilty and sorry. 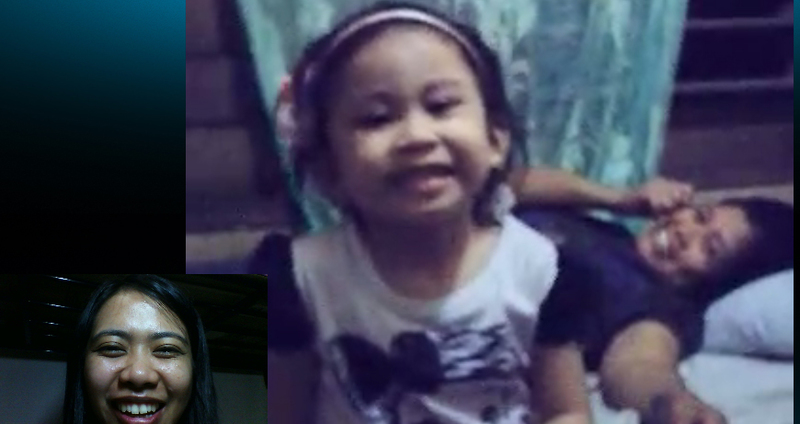 We didn’t talk to each other for a week until she finally decided to send me to Davao and break the tension between us. I wrote her a letter asking for forgiveness before I left. I was worried that our relationship was already ruined and that there was no hope of restoring it. But of course she is my mother and she forgave me. Everything was back to normal after my 1 week vacation at Davao. I hope you a full love tank today! I had a relaxing and refreshing day on my personal retreat. I’ve decided to take this because I’ve observed that I’m getting too tired a lot lately and it seems that I don’t enjoy all the things that I do anymore. I knew I needed time to think about my life. 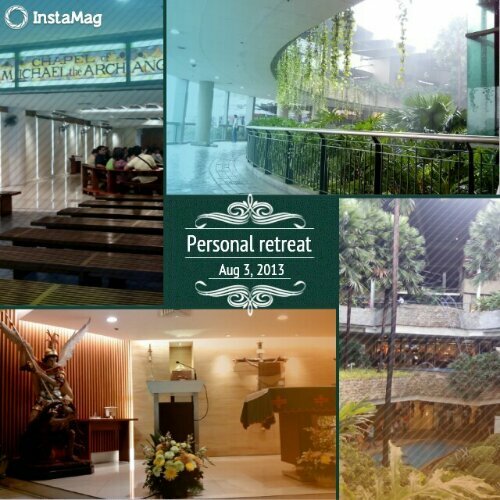 When I got to the office last Friday, I received an email invitation for an overnight retreat at Antipolo Prayer Mountain. I was amazed and overjoyed because on my way to the office, I ‘ve been thinking about where I’m going to stay for my personal retreat. I immediately responded to the email and informed the organizers that I was coming with them. However when I woke up on Saturday, I realized that what I needed most was an alone time to be with myself and with God. I didn’t want to go through the activities that the organizers have prepared. I didn’t want to exert any effort to mingle with the participants. It wasn’t what I needed at that time. So I texted the organizers again, apologizing that I won’t be able to come. I knew it won’t affect their retreat because I only asked to be added to the participants, my absence won’t really hurt. A few minutes later, I saw the sun shining and I quickly left and rode on the MRT. However when I was already in Cubao station, it rained heavily and it was already quite dark at 2pm. Good thing I remembered that there’s a garden at Trinoma and I could still gaze at the greenery. I was pleased to find the perfect location for my personal retreat. Or maybe it’s more fitting to call it my thinking-slash-reflection time. The ambience was perfect! The rain has drowned the noise of the city. It was cold and I was alone with my thoughts. The cake and the hot chocolate served at Tokyo Bubble Tea were also perfect. And to add more perfect-ness (no such term) to my day, there was a chapel near the tea place. Amazing! I was able to commune with God while the wonderful music of the choir enveloped the place. It was soothing, calming, and refreshing.